This is a very nice video explaining how to administer paste dewormer to a very nice, obedient horse. I’d like to see the same technique done with a horse that is difficult! I have a few of that type! Great video on a compliant horse but how do you handle a horse who is totally adverse to syringes of any kind whether worming or injections and has a tendency to throw a fit? A video on this would be nice. 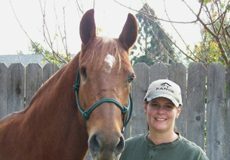 I am a first time backyard horse owner & I’m trying very hard to take good care of my horse’s health needs. I found this video very easy to understand & learned about the importance of dosing correctly according to weight. I will check your site frequently for help in the future with different things. Thanks so much for being here for people like me who love our horses but have little or no knowledge on health care needs. Excellent information for novices like myself. thank you for making that video my horses are hard for giving wormer but we use the grain wormer but i will try that. how often do u deworm your horse?everyone tells me diff. and it can get very confusing.i deworm him whenever he starts showing signs of having worms am i doing it wrong or is that ok ? When my dad deworms my horse,Mia,she makes the world’s funniest face!!!! Thanks for the tips. I have one horse that “knows its coming” and does everything to not take the tube. Nice way to deworm a horse even though they might not like the way that you are trying to deworm them and that is why they say you have to be very careful. Thanks, another thing checked off my horse care list that I needed to learn how to do. I’ve always done it this way, but always had to fight with my donkey! What he breeder taught me, is to just let a little dewormer on the end of the tube and let him lick it off, next thing he was trying to eat the entire syringe of it. He now is super easy to deworm!